Before we get into what we can do to get it renewed, let’s take a step back to shine a light on the history of the LWCF and all it has accomplished. LWCF funds have expanded and completed hundreds of new trails (including National Scenic and Historic Trails, which are celebrating their 50th Anniversary this year! ), built our National Parks, and funded many of your favorite local parks. Wow, right?! You may be asking yourself, “How do we pay for such a great program?”. Here’s the great thing, it doesn’t cost the taxpayer anything!! The LWCF is funded by fees from offshore energy development with the idea that if the government permits drilling offshore, some of the money raised should go to preserve our most cherished places on land. That’s why in 1964 Congress passed the LWCF to safeguard natural areas, water resources and our cultural heritage, and to provide recreation opportunities to all Americans. Fast forward to today, this crucial program is set to expire on September 30 if Congress doesn’t act (the program was last reauthorized in 2015 with overwhelming bipartisan support). So, what is AHS doing to make sure Congress acts? In partnership with a coalition of organizations, AHS is joining with congressional leaders to raise the public attention and build momentum to get this legislation passed. Marking 100-days before expiration we joined Senators Cantwell, Burr, Gardner, Daines, and Tester at a press conference and rally calling on leaders in Congress to take action! That same day we participated in a fly-in with advocates from across the country who have experienced firsthand the benefits of the LWCF. This included a hotel owner in Colorado whose customers are primarily recreation users on LWCF purchased land and a local trail volunteer working to see the completion of the Ice Age National Scenic Trail in Wisconsin. 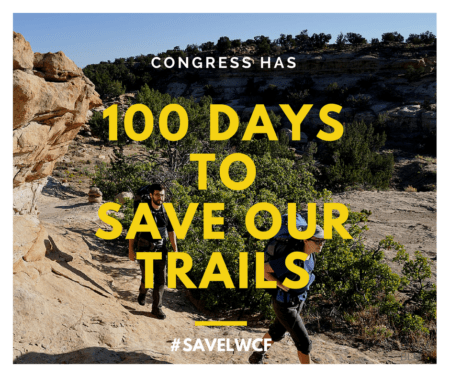 AHS amplified these messages and shared the voice of our members and supporters by delivering postcards to congressional offices on behalf of hikers and trail users who wrote to their Member of Congress during National Trails Day®, sending the message to #SaveLWCF and protect trails. The work here isn’t done and you can make a difference by contacting your Member of Congress and telling them to permanently reauthorize the LWCF! Together we can fight to ensure the LWCF continues to protect our natural resources and provide new places to hike! Abut 50 citizens attended a community meeting to view maps and get information from BLM recreation staff. The process is part of an ongoing Travel Management Plan being developed for the Tres Rios District covering Montezuma, La Plata and Archuleta counties. LIGONIER — During the school year, West Noble Middle School Principal Melanie Tijerina is calm and collected, as she puts out fires one at a time. So when her friend and mentor Beth Carter suggested she participate in the first June Ride from May 31- June 10 with the Michigan Trail Riders Association, she was initially hesitant. Tijerina isn’t a stranger to horses and riding, but wasn’t a master equestrian. She currently owns two horses at her home outside of Wawaka. Rebel, her trail horse, is 17. As the country’s leading service organization keeping trails open for horse use, Back Country Horsemen of America makes trail work a lifestyle. But they really get busy when there’s a good excuse to do trail work, and National Trails Day, on June 2 this year, is one of their favorite holidays. National Trails Day work can include just about any kind of trail work, from replacing trail treads and repairing bridges to trimming branches and removing downed trees. BCHers also keep trailheads clean and install niceties like corrals, water troughs, and mounting ramps. The San Joaquin-Sierra Unit of Back Country Horsemen of California works regularly in the Sierra National Forest. They recently held a work party on both wilderness and non-wilderness trails in the John Muir and Ansel Adams Wildernesses near Edison Lake. A second work party continued ongoing improvements to Chamberlain Camp near Courtright Reservoir. These work parties were made possible by a BCH Education Foundation grant. Fourteen chapter members formed the first party, a week-long stay based at the High Sierra Pack Station. With diligent work, they cut a total of 28 trees and brushed out a 200-foot section of badly overgrown trail at a creek crossing. The second work party went to Chamberlain Camp, an historic cow camp that is on the edge of the John Muir Wilderness. The San Joaquin-Sierra BCH has adopted this area and over a number of years has made numerous improvements, such as building an accessible outhouse, installing bear proof food lockers, and building hitching rails and tables. Old fencing has been removed from the perimeter of the meadow and packed out. Chamberlain Camp is a valuable amenity. Less than two miles from the trailhead and accessed over easy terrain, it’s an ideal location for the unit to take novice riders, youth groups, and members that are interested in learning to pack, without the difficulties of a longer wilderness based trip. Back Country Horsemen of Central Arizona recently completed an interesting and challenging packing assignment. They assisted a wildlife biologist from the Coconino National Forest Red Rock Office in packing out old fence materials from the Cottonwood/Mesquite Springs area near Camp Verde. Because of the size and awkward shape of the materials, it took some creative packing, master packing skills, and seasoned stock. They packed out several sheets of tin, over 50 coils of old wire, and dozens of metal t-posts and wooden stays. Removing debris like this is important because it sullies the pristine environment of the area, and can cause injury to recreationists or wildlife. In their effort to keep trails open for all users, San Juan Back Country Horsemen has adopted two trails, the Anderson and the Archuleta. Over the last several years, it has become a huge challenge to keep these trails safe and open, due to beetle kill destroying so many trees in Colorado’s southwest mountain forests. Ten club members with five stock horses and several folks on foot participated in a recent work party on the Anderson Trail in the Weminuche Wilderness. They carried in cross cut saws, hand saws, pole saws, and pruners, and worked a combined total of more than 65 hours. The group found the first of seven trees to be cleared was located four miles in, at over 8,500 feet elevation, through some very difficult trails. They cleared fallen debris, stray rocks, and overhanging branches, plus heavy brush in some very rough, rocky areas. Seven downed trees that were blocking the trail were completely cleared: no simple task! With sustained effort, they were able to open the trail all the way to the tree line. If you want to know more about Back Country Horsemen of America or become a member, visit their website: www.bcha.org; call 888-893-5161; or write 59 Rainbow Road, East Granby, CT 06029. The future of horse use on public lands is in our hands!